This weekly club is for adults only, every Thursday between 2.00pm and 4.00pm in the downstairs hall. Pop in on any Thursday and you will find a warm welcome. 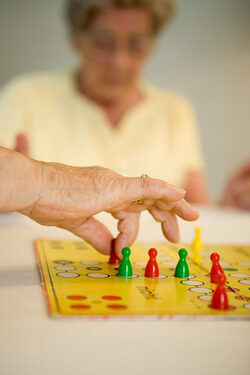 Activities on offer include: a quiz, card games, Scrabble, Rummikub, and other board games. We also have pool/snooker, table tennis, table football, air hockey and indoor boules. Some weeks we also have a craft table with opportunities for painting and making things such as cards, jewelry and so on. We have comfy chairs for anyone who wants to sit and knit, or just to chat. We start with tea and coffee at 2.00pm and the kettle goes on again at around 3.00pm for tea, coffee and cake. We sometimes finish with a mini ‘epilogue’; this could take the form of a poem or thought for the day and a song or hymn and short prayer. A pot is available for donations - we suggest around £2.00, if you can afford it - towards refreshments, supplies and heating. This website is maintained by volunteers from Centenary Baptist Church. Please let us know if you can't find the information you are looking for, so we can update our site, or any other comments you have about the site. We hope the information given has been useful. © Centenary Baptist Church 2016.